Brazil is in turmoil. It will hold a presidential election in 2018. The candidate leading in the polls - former president Lula - is under threat of imprisonment. The current government - led by a man who seized power in a soft coup - has little legitimacy. Even less do the people of Brazil trust their legal system (only 29% find it trustworthy). The people want Lula as their next president. The oligarchy that rules Brazil would rather die than accede to his return. Why is Lula so popular? Lula presided over Brazil from 2003 to 2011. In that period, his aggressive policies against poverty (Fome or Zero Hunger) reduced poverty by 55% and extreme poverty by 65%. Wages increased, inequality fell. Brazil, which was one of the last countries to abolish slavery, was finally able to hold discussions about racism and social hierarchy. Lula, charismatic and honest, captured the imagination of Brazilians who had only recently (in 1985) emerged from a harsh dictatorship. The Brazilian oligarchy vehemently dislikes Lula and the Workers’ Party (PT). Lula’s successor Dilma Rousseff was removed from office in a ‘soft coup’ in 2016 because of an accounting error rather than any real corruption for personal gain. Lula is accused of being given an apartment by OAS - a construction firm. There is no evidence that Lula took possession of this apartment or even set foot inside it. The statement of one man - José Aldemário Pinheiro Filho was taken by the judge - Sergio Moro - as gospel. Judge Moro has shown in many ways that he would like to humiliate Lula and use the judiciary to prevent him from being able to run in the next presidential election. On January 24, the Federation Regional Court of the Fourth Region (TRF4) declined Lula’s appeal. In other words, they said that they would abide by the lower court that found Lula guilty of corruption. The oligarchy has used the judiciary to disarm the working-class because it cannot win easily through the ballot box. What will the PT do now? Senator Gleisi Hoffman said at a labour rally on the day of the TRF4’s verdict that Lula will be the candidate of the PT in the presidential election. A few other appeals remain. These will be pursued. Meanwhile, Lula’s caravan has been going across the country, where he has spoken to large crowds of his hopes for Brazil. The mass movements of the people are behind Lula. João Pedro Stedile of the Landless Workers Movement (MST) said, ‘There is no justification for convincing Lula. The political activists of the Brazilian popular front will not allow Lula to be arrested’. There is no candidate as popular as Lula in the PT. The party will campaign with him right till when he might possibly be disqualified by the Superior Electoral Court (based on the Ficha Limpa - Clean Slate - law). The oligarchy knows it is in trouble. The courtroom on January 24 was surrounded by armed guards, including sharpshooters. The candidate of the oligarchy for the elections - Jair Bolsonaro - is a former military officer who comes from the far right. Even the oligarchs are embarrassed by his racism and sexism. He is the kind of disgusting personality produced in the sewers of the far right. To keep abreast on events in Brazil, read Brasil de Fato. 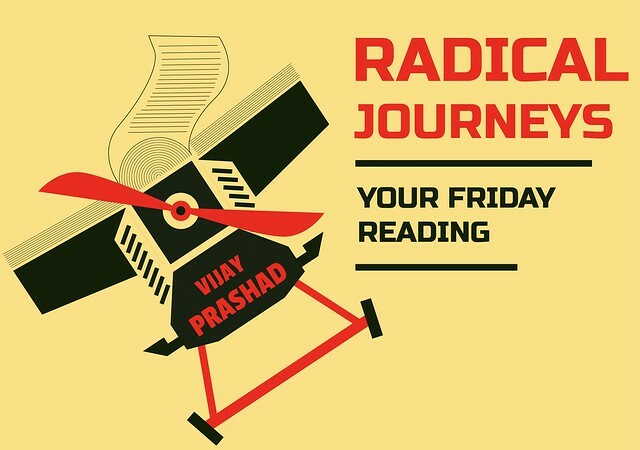 Vijay Prashad is the Director of Tricontinental: Institute for Social Research and Chief Editor of LeftWord Books. His most recent book is Red Star Over the Third World (2017).